"Ode to the Sea: Art from Guantanamo Bay" opened on October 2 this year, in the President's Gallery, located on the topmost floor of Hareen Hall, John Jay College of Criminal Justice in New York. It is a nondescript building located in a well-to-do section of Manhattan's Upper West Side, with much of the facade and entryway currently hidden behind renovation screens. The gallery itself is not much more than a hallway that opens up into various administrative offices. This unusual gallery space, is, however, the site on which the flotsam of a particularly brutal aspect of US geopolitical manoeuvring during the so-called "war on terror" has been made available to the public. The exhibition features 36 paintings and sculptures made by detainees at the US prison at Guantanamo Bay, co-curated by art crime professor Erin Thompson, archivist Paige Laino and artist and poet Charles Shields. Following its opening in early October this year, "Ode to the Sea" began to receive overwhelmingly positive press. By mid-November, seemingly as a direct result of the attention that this exhibition refocused on the detainees, the US Department of Defense (DoD) announced that it will suspend transfers of artwork out of Guantanamo by legal representatives. Air Force Major Ben Sakrisson, a Pentagon spokesman, declared all Guantanamo detainee art "property of the US government", and expressed grave fears about the financial proceeds of sales. The DoD also threatened to remove what it considers "excess" artworks and said it might destroy them. Thompson informed me that camp officials recently seized a sculpture that one detainee, Moath al-Alwi, had completed after many months of work. He could only communicate his despair and frustration to his legal counsel. Despite the insinuation that John Jay College, the curators, alleged al-Qaeda "terrorists" held at Guantanamo Bay, and their legal counsel may profit from sales, Thompson clarified that this is not the case. The curators can be contacted if a member of the public is interested in purchasing the artworks; they will, then, connect the potential buyer with a lawyer for detainees who have been released. Since the lawyers work pro-bono for detainees, they, too, do not benefit financially. Only those detainees released, repatriated, or resettled in a third-party country, after a rigorous and years-long process of assessment of their individual cases, are able to receive monetary compensation. Threatening to confiscate and destroy artworks seems contradictory to policies implemented at Guantanamo. Military officials had made concentrated efforts to improve conditions for prisoners - including providing the art classes in which these works were made - in an attempt to prevent prisoners from disintegrating into despair and resorting to self-harming actions (including suicide attempts). Given those efforts, why attempt to control objects to which it paid little attention before, and threaten to destroy them? Why exactly are these works of art so powerful? 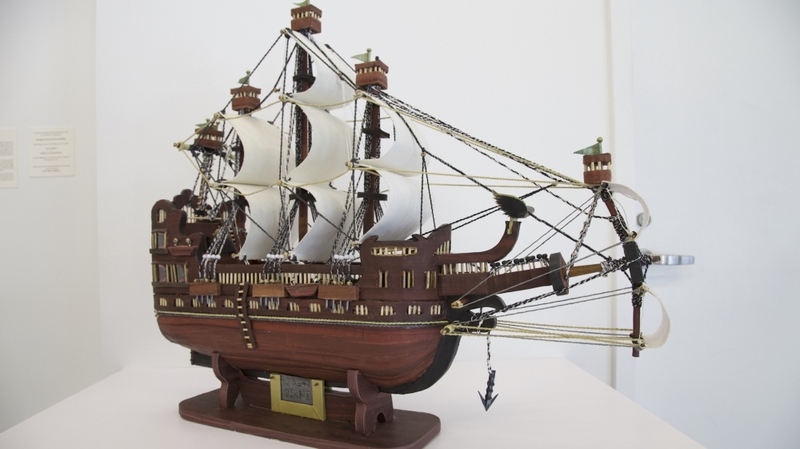 The first object that greets visitors of the exhibition is an intricate model sailing vessel, replete with billowing sails, several masts and viewing turrets. Its massive body is on the way somewhere, directed and fully absorbed in meeting its goal. The winds, too, have blessed its journey: each square of sail is stretched to its full convex potential, moving the vessel forward. When we get closer and peer into the plexiglass box holding this ship captive, we see some other, curious details: a ship's wheel, in gold, and a little black anchor hanging incongruously from the vessel. The date is stamped in red, while all other lettering is in fading black ink. This sailing vessel, titled "Giant", was constructed by Alwi, who has been "detained" at the US prison at Guantanamo Bay since 2002. It was shipped to the US - after extensive inspection and x-rays to ensure that it did not contain any contraband or hidden messages detrimental to US security - especially for this exhibition. Thompson notes that although Alwi has constructed many seafaring vessels, he was very proud of this particular ship; when it did not appear in initial images she took of the exhibition (the special plexiglass cover for it was still being completed), he communicated his ire openly with his legal counsel. "Where is my ship?" he purportedly asked. To Thompson, that Alwi was throwing a bit of a tantrum - that he was "acting like an artist" - was a positive development. For a man whose person has been systematically and brutally subjected, for over a decade, to a powerful empire's exercises of power, for a person who has "disappeared" in a torture camp, this ire - a display of ego - is a sign that no amount of machinations by the US has managed to fully to erase his subjectivity. Because they were neither formally charged with any crime, nor afforded prisoner-of-war status according to the Geneva Convention, the men at Guantanamo came to be labelled "unlawful combatants" or "detainees", who have no legal protection within US or Cuban frameworks. In many ways, each of these artworks is evidence of an attempt to counter the US' elaborate methodologies of removing these men's subjectivity. Creating these artworks is a profound act of non-erasure - illustrating will, longing, a desire to communicate both beauty and suffering, and to project longing onto a surface - to materialise their fantastical hopes where they, and others, can see them. Many detainee-artists depict the sea or other bodies of water, and seafaring vessels, both great and small. Ghaleb al-Bihani's "Untitled (Red and Purple Boats)" shows two simple wooden boats listing in the water, while an agile sailboat speeds past in the distance. 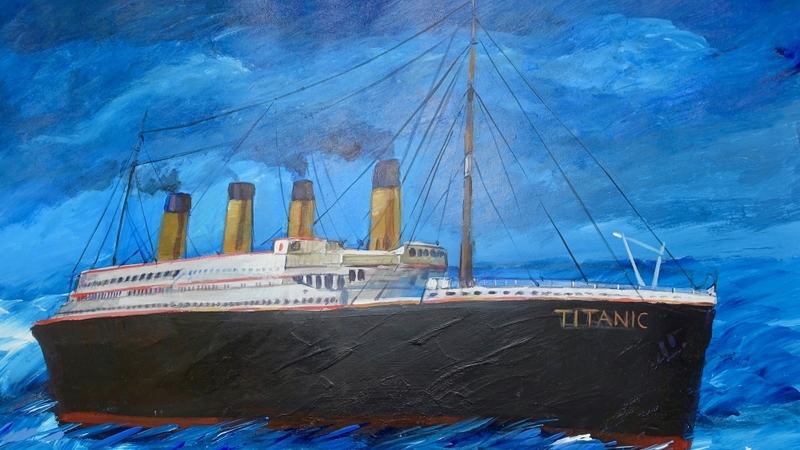 Muhammad Ansi painted the grand Titanic - that ill-fated ship - after he, and other prisoners, were permitted to watch the film. In his painting, the infamous ship - one that was sold to the world as so advanced and powerful that it was unsinkable - is propelling itself purposefully into a future that its makers and financers imagined they controlled. Other detainee-artists paint cityscapes, tranquil rural scenes, and still-lifes, inspired by prints or images from National Geographic magazines permitted to them. However, Abd al-Malik (al-Rahabi) Abud, originally from Yemen, and detained at Guantanamo for nearly 15 years before being released to Montenegro in 2016, paints his country's capital, Sanaa, as it exists in his memory, but is no longer there. Djamel Ameziane paints what look like two or three-storey farmhouses in a European landscape. Later, I learn that he fled his native Algeria as a young man for Europe, before being sent to Guantanamo. Although he was eventually cleared by the US, he did not wish to be returned to Algeria - but this is, indeed, where he was returned. I like to think that, perhaps, these countryside scenes Ameziane paints conjure up the only location in which he found a moment of respite - the home for which he longs. There are artworks that fall completely out of any of these easy attempts to categorise. 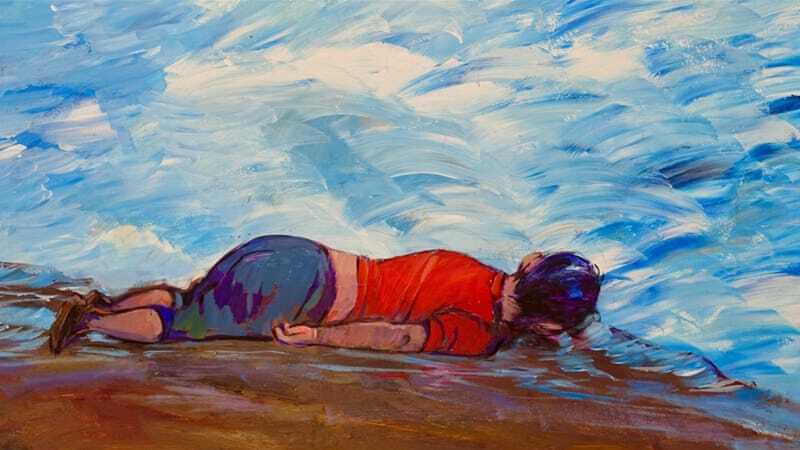 Muhammad Ansi's "Untitled (Alan Kurdi)" is clearly a painful contemplation of the three-year-old Syrian boy who drowned, almost within reach of the Greek island of Kos, in September 2015. The boy's back is turned to us, the viewers, as it was in news photographs. The brilliant red of his shirt stands stark against the blue half-saucers of sea waves, which, through Ansi's paint-strokes, also become as light as the sky - the heaven to which this child's soul departed. 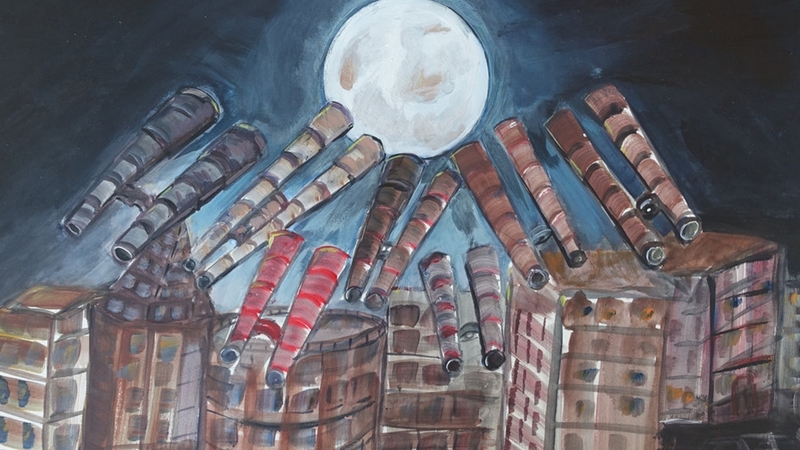 In "Untitled (Binoculars Pointing at the Moon)", Ahmed Rabbani depicts massive, tubular telescopes, projected from the tops of multi-storey buildings towards an enormous, luminous moon. It mimics the way in which Rabbani experienced how he, along with the whole world, anticipated a supermoon that "was at its closest point to earth since 70 years", he says. On a subtler level, mirrored in Rabbani's myriad of telescopes aimed at a single object, are the attempts, by the United States government and its interrogation apparatuses, to render prisoners to the state's "x-ray" like vision - to make them completely transparent, readable, and therefore controllable, under interrogation and constant surveillance. According to Human Rights Watch, the number of prisoners at Guantanamo at one point was 780, with many brought in because of extrajudicial kidnappings and extraditions from countries that had little to do with the "war on terror". Initially, parading these anonymous, hooded prisoners, and deliberately concealing their identities served a powerful empire’s need to reveal and revel in its material and symbolic devices of power. As scholar Scott McClintock noted in a 2004 article, herein lie clues into the motive for kidnapping, imprisoning, and torturing people that the US government knows are not guilty of terrorist activity: the "enemy combatants" in the gulag of Guantanamo Bay replaced the void in power created by the "disappeared" Twin Towers - those symbols that once stood testimony to American might. In the prison camp at Guantanamo, the detainees became symbolic stand-ins for its enemies". This exercise also told the US public, anxiously waiting for their nation to regain power: "See, we have caught them. You are safe." However, the more that evidence countering those elaborate displays of power and justice seeped out - illustrating that the incarcerated at Guantanamo had little to do with terrorism, that high-level US officials had authorised medieval techniques of torture and prisoner dehumanisation, used an archipelago of colonised islands in the Indian and Atlantic Oceans as way stations in their scheme to kidnap and transport a steady stream of men on "rendition flights" - the less visible the prisoners became. That backstory also helps us understand why, within the last month, there has been a backlash against this exhibition, despite the fact that for a long while now, US audiences seem to have forgotten that a detention and torture camp at Guantanamo exists. Much like Alwi's ship with its billowing sails, each of these works shows that each man who still creates has ambition and focus, and makes a much-longed-for goal come to fruition. When the goal of the state power that has incarcerated these detainees has been concentrated on removing their subjectivity and individuality, reducing them to a number (even the guards at the prison call the prisoners by their number), this is a remarkable feat. For those reasons, Thompson thought it important to show these works in an area with heavy foot-traffic, where John Jay's students, staff, and faculty will see the works. If one comes to see these works with the view that art is meant for enjoyment or pleasure alone, then they will probably have a harsh view of the absurdity of displaying tortured, indefinitely "detained" men's artwork in New York City. Thompson emphasised, however, that she "worked hard to make sure that this exhibit…display[ed] the art in a manner desired by the artists themselves, which of course includes reminding viewers of what they have/are suffering". We know that art can trigger far more complex conversations. It can reveal that which we would rather not know about, it can contradict the powerful who attempt to control what comes into our visible spaces, and it can move us out of our social and political inertia, and challenge us to take action. According to Thompson, audiences who have come to see the works are engaging with these works politically, as unintended material evidence (or debris) of their country's exercises of power. Yet - despite these efforts by many US citizens, including the detainees' pro-bono lawyers who worked, in the years after 9/11, to educate their fellow citizens, and to resist, challenge, and change policies that came to be as a result of the "war on terror" - state propaganda remains powerful. From teaching what is popularly referred to as "literature of 9/11" and legal articles concerning US policies since 9/11, I know that most of my students believe that the men in Guantanamo are terrorists, and not much more. They do not know, until they read legal papers assigned for class, that many of those in Guantanamo were turned in to US authorities because they were simply in a war zone when US forces invaded Afghanistan and Iraq, or because of deeply problematic reasons - some are arrested on evidence given by business rivals, or simply sold by those who hoped to earn what would be a large amount of money (the US dropped leaflets offering rewards for turning in terrorists). Others, still, were brought in for even more absurd reasons: They had a name common to that region, one that was - by unfortunate coincidence - the name of a person allegedly involved in terrorist activity. The case that baffles my students the most: the man who ended up in Guantanamo because of the mere fact that he owned a Casio digital watch, because its mechanism was thought to be used in bomb-making. The conversations I overheard while visiting the gallery where detainee artwork is displayed told me that the greater US public has been equally baffled by these intricacies and deceptions. Some know that the Obama administration promised to close Guantanamo down forever, and did not realise that it was still in operation. They do not know that as President Barack Obama's second term came to a close, of the over 700 men who were once held there, 41 detainees - mostly from Yemen - remain. They also did not realise that only one of the men has been charged with a crime, but that, because of "instability" in the remaining men's home countries, it was deemed too dangerous to release them back into spaces where they may re-join factions fighting against US interests. The complications of contemplating and engaging with artworks by detainee-artists involve feelings of being defeated and hopeless, and wanting, even then, to find ways to engage and challenge the roaring beast of empire, and the desire to find ways to bear witness without exploiting the detainees' very real pain and torture. Of all the unbearable absurdities in this exercise of US power, the one that my students, the audiences at this exhibition, as well as detainees at Guantanamo themselves find to be the most unbelievable is this: that citizens of the same nation that kidnapped, forcibly transported men in chains to a burning island and continued to torture them for over a decade are also trying to defend and free them. This gives us hope that the labour towards freedom is not pointless, and that we, too, cannot afford not to engage in this work. Copyright © 2019 War Criminals Watch. All Rights Reserved.